I love that cover. The guy facing Shade with the gun totally looks like he's got the drop on him until you realize there's a giant force-field foot about to stomp down on him. The cover's interesting for a couple of reasons. Mellu's outfit is reminiscent of Ditko's Dr. Strange work, the weird patterning and colours, and reminds me of Clea's outfits that curdled my pre-pubescent brain. It's also the first one to not feature the little sequence of three boxes down the left-hand side giving us an inset action piece to on the cover. I think those boxes are an interesting design characteristic, but not necessarily a successful one. Yesterday's sequence looks like it's playing in reverse, and I'm not sure what the point of it is. The cover of a comic needs, I think, to be simple. Eye-catching, yes, but not something that can't be sussed out in a single, brief glance. This one is simple. Title, action piece, interesting colours and costumes. What else can I say about this story so far? I'm shocked with each issue that it's taken me so long to finally get around to reading it. It's really good. I think I've finally figured out who the major villain is, the supporting characters are expertly fleshed out in Fleisher's dialogue, we get new revelations (like finally seeing the "Zone of Madness" this issue), and, of course, Ditko's art is superb. I only hope that the story, or at least this initial arc, has a chance to play out in the 8 extant issues. 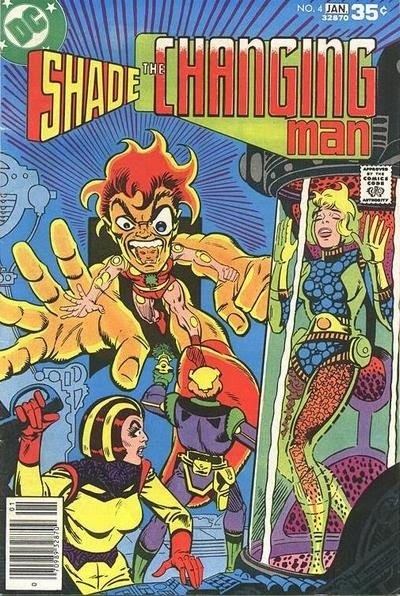 The series was cancelled, though the 9th issue appeared in an issue of Cancelled Comics Cavalcade. If I can find a good scan/download of it, I might include it as one of my daily comics. Four more days of Shade! Will we find out who the villainous Sude actually is? Will Mellu ever forgive Shade? Will I end up reading another 70 days of Shade in Milligan's run because each time I read one of these issues, I remember how great it is? Time will tell.